Kudos to Brandon Bir, who recently achieved Level 1 Certification from the Barista Guild of America. Typical for Brandon, he earned a perfect score of 100 percent. Barista Guild Certification is based on industry standards and best practices of the Specialty Coffee Association of America. A Coffee and Training Specialist, Brandon is a key member of our coffee-buying team. 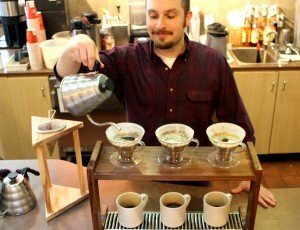 He takes several coffee-sourcing trips each year and runs our cupping lab. He also teaches independent coffee house owners how to run a successful coffee business through our Seven Steps to Success franchise alternative program. Congratulations, Brandon. We’re extremely proud of you!